Story dedicated to all the so-called "badly named" pets of Neopia! They all deserve caring owners. The early morning sunlight filtered in through a small dirty window. A green Techo stared at three claw marks on the wall. That’s how many times he remembered being returned to this very room in the Neopian Pound. He was so young the first time he didn’t even remember where he came from. Sometimes it seemed as though he had always lived here. He curled up on his too-small bed and thought back. That very first time, he was thrilled to be going to a new home. His new owner had exclaimed about how cute he was. “All young pets are cute,” he thought with a sigh, “but that cuteness wears off.” Indeed that is how he found himself back at the pound that first time. He had grown only a little older but was starting to eat more and demand more attention. The Techo rolled his eyes to himself and began tracing a brick on the wall with one claw. “As if I had a choice what my name was,” he thought glumly. His name continued to plague him, though. His next owner had picked him up one day gushing about how cool it was to get a Techo here and rambling about all the nice colors he could be painted. The Techo didn’t know much about being painted, but he’d seen a few pets come in the pound that were all sorts of dazzling colors. They always left quickly with new owners. He had excitedly watched over the course of a month as his owner ran about like crazy earning enough neopoints to get a paintbrush. On the day he was supposed to get painted, his owner was late. He was starting to get hungry when he finally heard footsteps on the path out front. He rushed to the door to see what color he was going to be painted. He opened the door only to come face to face with a Striped Techo. “No, dear,” the owner said hurriedly. “He’s just visiting. Now you go in and enjoy your new home. As for you,” she gave the green Techo a hard look, “come with me.” She grabbed his hand and dragged him towards Neopia Central. “Am I going to be painted now?” he asked hopefully. At that accusation, there was no response. For the rest of their walk to the pound, the girl had been silent. He hadn’t been hopeful about finding a new owner again. He was still unpainted and still had an undesirable name. Several months after that incident, he had been briefly adopted by another person. That owner already had three pets when the Techo joined them. There were two large Skeiths who weren’t particularly friendly and a Scorchio who didn’t say much. He had only been there a brief time when the owner came home excitedly carrying a large blue egg. The Techo wasn’t overly sad when he was taken back to the pound; that owner had said he needed a space for the Draik to hatch. He hadn’t really gotten along with that family anyways and a Techo isn’t really dragon-like. Now he was lying on his small bed in the pound once more. The three claw marks on the wall were like wounds in his heart. A squeal made the green Techo involuntarily glance their way. He saw a tall girl holding the hands of two Zafaras. One was painted Christmas and had been the source of the squeal. The other was painted Halloween and didn’t look particularly happy. “What’s his name?” the Christmas one asked. Of course. The green Techo groaned and rolled back over. Like every other time, this was not going to be good. Maybe he should try ignoring it. The girl looked at his name plate. “Lunch_stealin_lizard,” she announced. He thought for sure they’d walk away quickly. Within a few seconds, however, he heard giggling. He looked back at the trio and blushed, embarrassed that they thought it was funny. “You haven’t stolen anyone’s lunch now, have you?” the girl asked with a giggle. The Techo felt angry again. “Of course not! I didn’t choose my name!” He turned away with a huff and crossed his arms. “Me? You want me? Even with my name?” he replied, eyes wide with shock. “It says you’re a boy too,” the Techo said, confused. “Angel Zafara? I thought she was painted Christmas?” the Techo inquired. “I’m painted ANGEL!” the little Christmas Zafara replied stubbornly, indignant enough to make her wings quiver. She finally set the Techo down and the Halloween Zafara approached. “You can call me Death!” he said sinisterly. The Techo paled but the girl piped up, “Oh, don’t be silly. Death is really quite nice.” She then giggled at her own joke. The group walked out of the pound into the late morning sunshine. “Now, who wants lunch?” the girl asked. “We want Lunch!” the twins chimed and quickly hugged Lunch. Lunchie smiled at her. “Sounds good to me!” This may be the silliest family he’d ever encountered but it seemed like he was finally going to fit in. Strange name and all! Peter realised his mistake as soon as he said it. Hagan was the King of Brightvale, not Meridell. He'd just said it without thinking. How does your Neopet greet others? "Where'd it go?!?!" a voice shouted out. The shuffle of feet followed the voice. 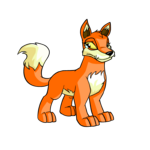 Four hyperactive looking neopets rushed through the halls of their neohome.